A guide to give students resources to prepare for the California State Bar Examination. Included in this guide are materials on admission, essays, performance tests, MBE (multi-state exam), and MPRE (multi-state professional responsibilities exam), etc. The MBE is a six-hour test made up of 200 multiple-choice questions. The topics covered by these questions include subjects typically taught in Constitutional Law, Contracts, Torts, Property, Criminal Law/Procedure, and Evidence. As of February 2015, Civil Procedure will now be included in the MBE exam. The performance test questions are designed to test an applicant's ability to understand and apply a select number of legal authorities in the context of a factual problem. Applicants will be given a file and library with instructions on what tasks is expected. Each three-hour essay session consists of thee essay questions. Answers are expected to demonstrate ability to analyze the facts of the question, to distinguish between material/immaterial facts, and to discern the points of law and fact upon which the question turns. Applicants must demonstrate proficiency in applying and using legal principles. 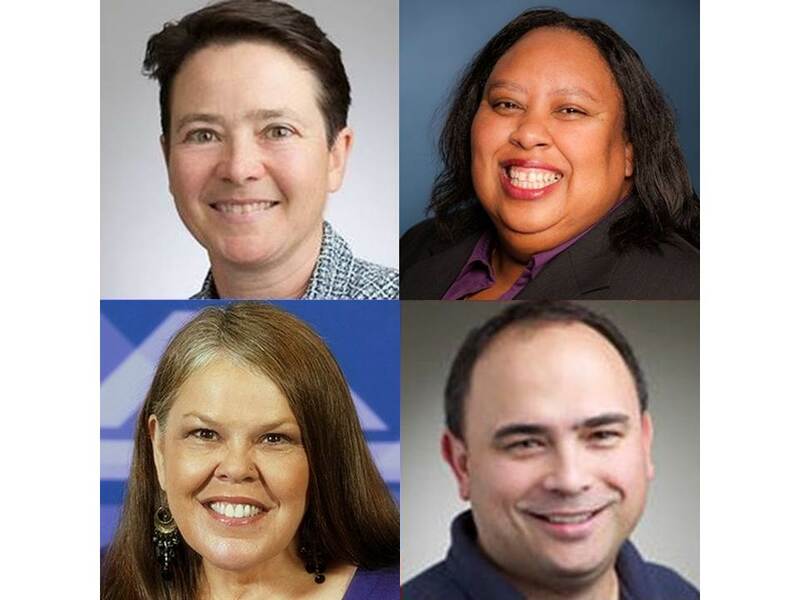 The materials listed below provide general resources on studying for the bar: including resources on how to develop effective study methodes, stress reduction, and life balance. Unless otherwise indicated materials listed here are located in either the Open Law Reserve Room or Closed Law Reserve Room. The first half of the book is tips on how to write better essays, and the second half is 80 full-length essay exams with model answers, from states across the country. The tips section is built on Gallagher's essay writing system which is based on the well-known IRAC system, that she has modified into "CRAC" (Conclusion, Rule, Application, Conclusion). General background information about taking the bar exam. It walks you through the entire bar preparation process from getting a head start during your last year of law school to taking the exam. It provides guidelines for selecting a bar review course, bar planner checklists, advice on how to manage the material you cover in bar review courses, and how to learn the law so you can remember it and use it to answer exam questions. It identifies the basic skills the exam tests and the precise manner in which these skills are tested, showing you how to target your study efforts to maximize results. Each component of the bar exam is examined through examples and detailed analysis of sample answers. This book doesn't teach you the law it explains how to properly prepare for the exam. The chapters in this book break down the process into an effective study method that can be easily and quickly implemented. The authors' goal is to make everything surrounding the bar exam less foreign and scary, all the while maximizing your chances of passing. The process will help you pass by teaching you to plan ahead, keep your cool while studying, remain organized and follow detailed schedules. 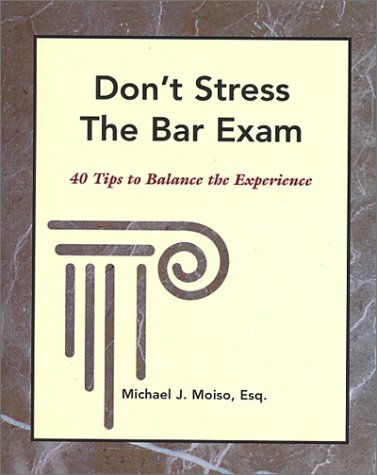 Don't stress the bar exam by Moiso, Michael J. 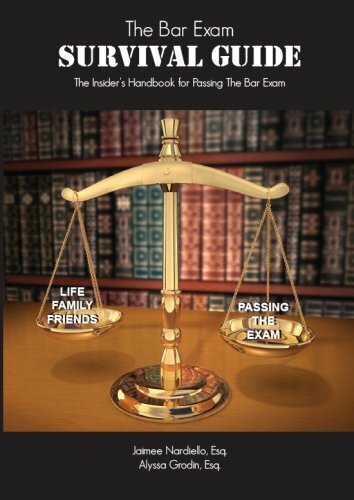 40 helpful tips to find balance with the bar exam. You are introduced to a comprehensive approach to your preparation and organization that challenges you to consider all aspects of the bar exam experience. Learn how to balance your needs with the needs of the bar exam. 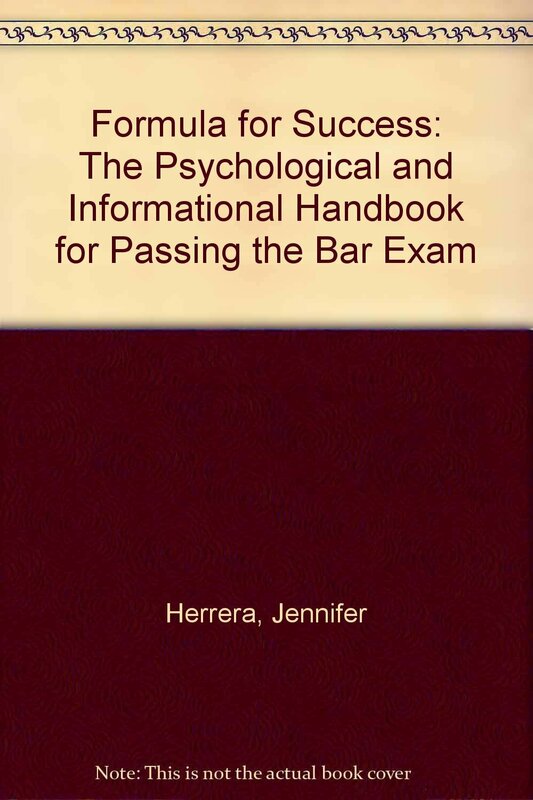 Formula for success : the psychological and informational handbook for passing the bar examination. by Herrera, Jennifer. 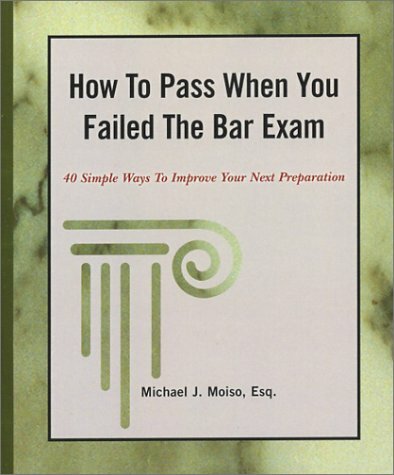 How to pass when you failed the bar exam by Moiso, Michael J. 40 simple ways to improve your next preparation. 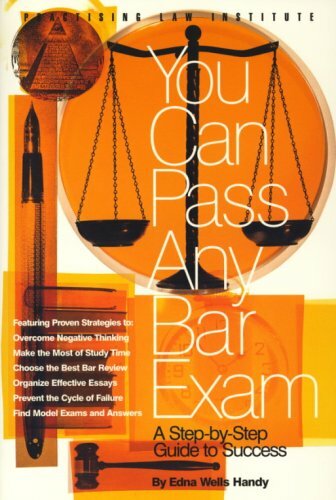 This book goes where many bar-related books don't - into the mental obstacles that tend to go hand-in-hand with the bar exam, in particular, doubting your own capabilities. 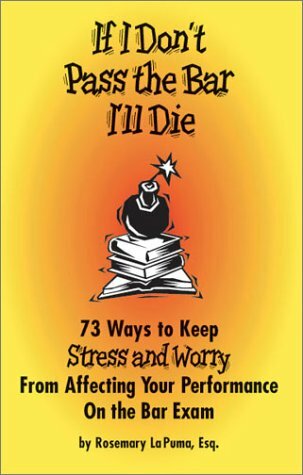 The book is like having a mini psychologist, giving you the tools to deal with stress and that annoying instinct to freak out. Pass the bar! by Riebe, Denise. This book provides a comprehensive overview of the pre-bar review, bar review, and bar exam process. 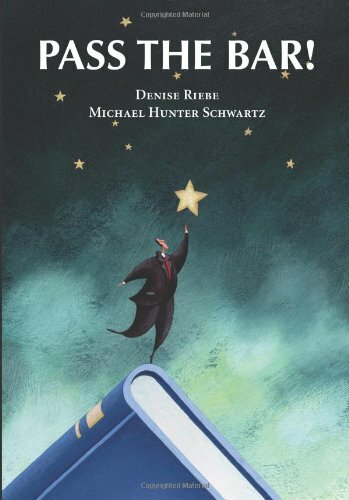 The authors demystify the bar exam process and take readers through the steps they need to follow to succeed. Included in this unique resource are sample bar exam questions, examples of daily and monthly schedules, listings of bar admission information for the states and territories, helpful bibliographies, an evaluation of selected bar review courses and much more.